Customers will be begging to get there hands on the goodies in this Pastry Display Case. The clear acrylic case lets them easily see the temptations before them. Who can resist the urge to bite into a fresh doughnut or pastry? 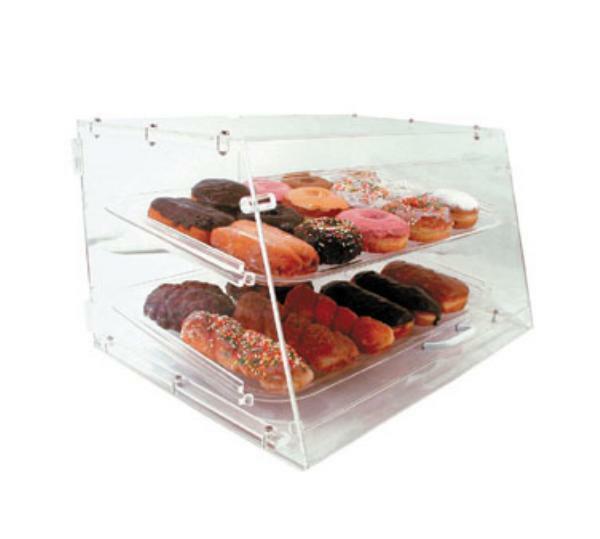 This bakery case will keep your delectable treats in plain sight and fresh. Customers will be checking the pastry display case out whether its filled with donuts or bagels. By placing several on your counter tops you can offer a wider variety to the delight of all. Purchase today. Dimensions--21" x 17-1/4" x 12"
This was exactly what we were looking for! We searched everywhere and finally found this and we are now planning on using it in all of our stores!